Introduction: Freestanding ambulatory surgery centers (ASCs) use has greatly increased. 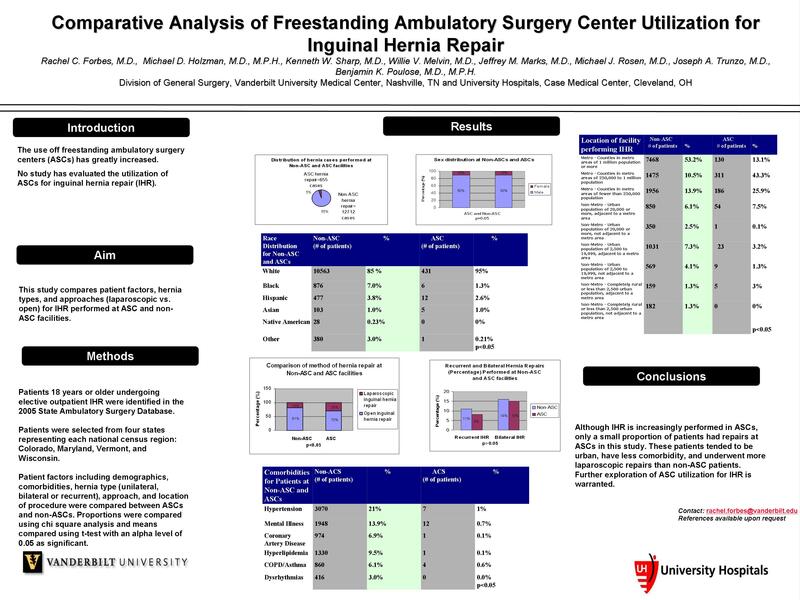 No study has evaluated the utilization of ASCs for inguinal hernia repair (IHR). This study compares patient factors, hernia types, and approaches (laparoscopic vs. open) for IHR performed at ASC and non-ASC facilities. Methods: Patients 18 years or older undergoing elective outpatient IHR were identified in the 2005 State Ambulatory Surgery Database. Patients were selected from four states representing each national census region: Colorado, Maryland, Vermont, and Wisconsin. Patient factors including demographics, comorbidities, hernia type (unilateral, bilateral or recurrent), approach, and location of procedure were compared between ASCs and non-ASCs. Proportions were compared using chi square analysis and means compared using t-test with an alpha level of 0.05 as significant.